Hurry!! Run!! Offer Ends November 14th, 2016. 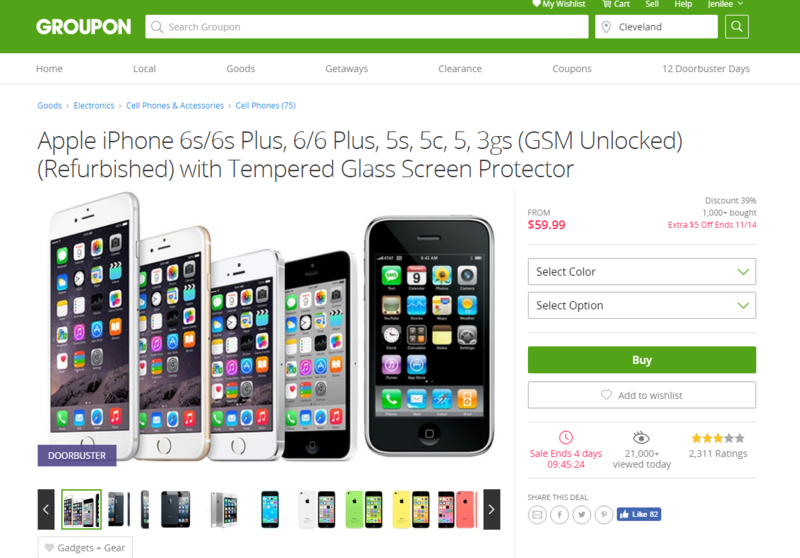 Get Unlocked – No Contract, Apple Iphone 6, 6S, 6 Plus, 6S Plus, 5, 5S, or 5C for just $59.99 in this AMAZING groupon offer. This would make the PERFECT Christmas Geek for anyone longing for an Iphone this Christmas. At THIS price, it’d even be great for kids and teens! — Especially since it’s only one generation behind the current Iphone models — I STILL use my Iphone 6S — and LOVE IT!!! And just under 1 year ago I had to pay the FULL out of contract price (several hundred dollars!) — This is a massive discount on a still very powerful and amazing smart phone — the best phone in my opinion for any GAMERS out there on your holiday shopping list — Don’t miss the chance to pick up a hot Christmas gift!! Or give yourself that long overdue upgrade to a new smartphone. These are GSM devices which makes them incompatiable with verizon or sprint — However, since they are no-contract, you can use them with any GSM carrier — including ATT, Straight Talk prepaid plans, and many more!! Grading: good – some cosmetic imperfection on front, back, or side of item. Item will come in bulk packaging.